Lots 57, 72, 90 are out of the sale. All sale horses have a current Coggins test, and a vet will be on hand to write health certificates. Equine insurance agents are also at the sale and can write a policy on the spot. See details inside back cover of the Catalog. If you are at the sale without a trailer, or purchase over the phone or internet, yes, your horse can stay at the Fairgrounds overnight. Our crew will put them back in the barn and feed and water them. We will help you load out on Sunday. If you cannot pick up your horse right away, please call Jim Hunt (605)365-7249 or Lis Hollmann (605)890-1610 to make arrangements to take your horse home. Hi folks. Hope everyone is enjoying their summer! Here is information on our Host Hotel for the September 8 Horse Sale in Rapid City. (605)343-8550 for Reservations; ask for the Horse Sale Rate. Located right off Interstate-90, they have a lap pool, indoor water park, plenty of parking, easy access to the Central States Fairgrounds, and one of Rapid City's most popular restaurants! 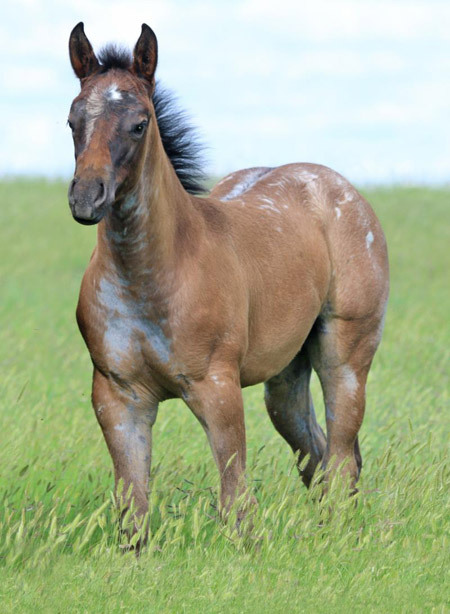 The 2018 foal crop is on the ground, the 2018 sale catalog is starting to go online under Horses For Sale link on our homepage, and we will be posting new sale horse photos as we go. Pictured is the Flit Drift blue roan filly out of Colonels Oprah - she's a good example of the Flit Drift fillies: athletic, alert, with color and class! Also, please note our new Merchandise link, with our first item for purchase, Eight Sisters Cookbook. This cookbook is one I compiled for my mother and her seven sisters and two brothers, a family of outstanding cooks. It makes a great gift for wedding, shower, birthday, etc, and contains some of our favorite recipes, including Calico Beans, which we serve after the horse sale to our sale crew, buyers, and friends! We will be adding OBRR tee shirts, caps, and some special purchase items as we go. Please check back periodically for new horse sale info, updates, pictures, recipes, etc... and thanks for visiting! Lot 4... is chestnut, not sorrel, and the scrape on his shoulder (visible on his video) has healed nicely. Lot 6... has shed off blue roan. Lot 17... has shed off nearly black or darkest dun, very pretty filly. Lot 80 ... is out with an eye injury, another Youth horse will be substituted. Open Box Rafter Ranch. All rights reserved. Site proudly designed and hosted by Big Sky Internet Design.